Dan Waters: In January 1955, not long after I had arrived in Hong Kong, and when I was a lecturer at the Technical College (since upgraded to the Polytechnic University) in Wood Road, Wanchai, I visited a number of our building students who had been attached for six weeks to building sites. I was accompanied by a Chinese colleague who became a lifelong friend. This gave me the opportunity to observe for the first time various building practices in what was then a British Crown Colony. We first visited the Government Electrical and Mechanical Engineering establishment, in So Kon Po on Hong Kong Island, where a new workshop was being built. I remember a group of middle aged Chinese women were knocking nails out of dismantled timber formwork. These nails were then straightened for reuse. The women were paid HK$1.50 a day. A skilled craftsman at the time received about HK$5.00 a day. (Just after the end of World War Two I was informed people would work a full day for two bowls of rice). The practice of straightening nails continued for about another three years. After then it was more economical to buy new nails. Later, my colleague and I visited Alexandra House, in Central, which was being rebuilt in 1955. There, the clerk-of-works said to me, ‘We have wheel barrows on this site!’ This was quite an innovation at the time as, previously, objects had been transported largely by ‘carrying (shoulder) poles’. In the 1950s it was common practice for concrete to be mixed on the actual floor of a new building which was being constructed. As the new structure increased in height so did the level at which the concrete was being mixed. It was not until 1963 that trucks carrying ready-mixed concrete could be spotted on the roads of Hong Kong. In 1957 I took a party of building students down to Central to see an exhibition of ‘Acrow’ tubular steel as well as tubular aluminium scaffolding. 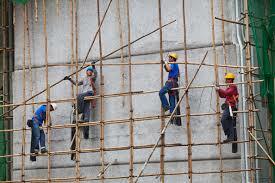 At the time a number of people were saying that, before long, these would replace bamboo scaffolding. 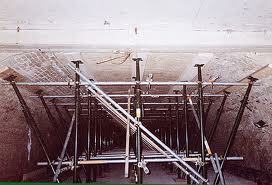 That was well over half a century ago but bamboo scaffolding is still very much with us in its original form. There is one difference however. Previously the bindings had been slivers cut off the outside of bamboo although these had been soaked in water to make them more pliable. In the 1970s these were replaced by plastic lashings. One disadvantage of the latter is that they are not biodegradable. Hong Kong is not the only place where significant progress has been made in many fields. When I left England in 1954 it was not customary for ‘hard hats’ (safety helmets) to be worn on building sites. Quite rightly, since then, safety regulations have been tightened considerably, not only in the United Kingdom but also in Hong Kong.